Working through a couple support issues recently it turned out that the presence of a Named UCS prevented us from linking a DWG using By Shared Coordinates. Revit would force the DWG to link using Center to Center instead. We tried all the things to resolve it first until we remembered to check this too. This has been a part of Revit for a long time, the "REVIT60" in the name is the Revit version when it first appeared, Revit 6.0. 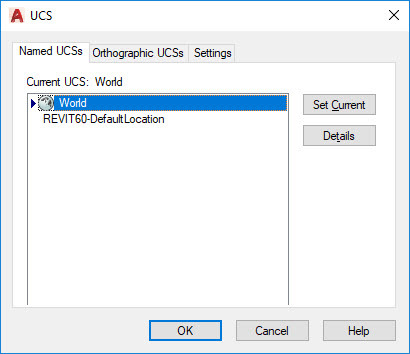 When we use Publish Coordinates on a DWG file Revit creates this UCS so it can be used from within AutoCAD to ensure any external references that need to align with it will do so. 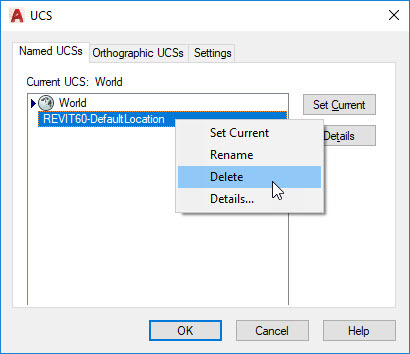 We can delete the Named UCS in AutoCAD by right-clicking on the name. We have more than one site related DWG for each project to align within Revit. We used Acquire Coordinates on our benchmark file. 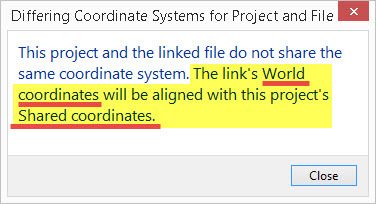 When all the related DWG files share the same WCS origin we can tell Revit to use By Shared Coordinates when linking them. An obtuse but factually correct message appears telling us the files don't share coordinates. 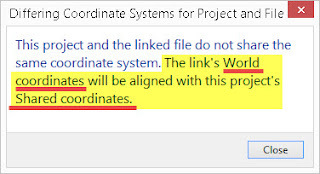 Aligning the file based on its WCS is precisely what we want so each of the files align in Revit, possible, again, because we used Acquire Coordinates on the benchmark file first. That aligned the Shared Coordinates with it so the other files could stack on top of each other properly when we linked them. There are many subtle things that can affect the linking process with DWG files, add this to the pile. This provides ample distraction from writing as much as I used to. I can hit ALL the THINGS!! Yes, I've been earnestly playing the drums again. When I moved to California the three piece band (Angry Neighbors) I had been part of for roughly ten years found themselves without a drummer. They've kept themselves busy since, most recently as part of a group they call Harmonic Dirt. For many years steady travel for work made it impractical for me to be part of a band here. I haven't needed to travel nearly as much for the last couple of years and I realized I could make it work. So far so good. Last May I joined a band called Parker Street Gypsies. It is led by and features songs written by Michelle Kasajian (vocals/guitar). Armando "Mondo" Lopez (guitar/vocals) contributes songs as well. Add in Charlie Peck (bass guitar) and yours truly to provide the foundation and we make four. We've been rehearsing regularly working toward playing in front of people more often. Our first time out was at the O.C. County Fair. Our next gig is THIS Saturday, December 2nd at The Whiskey a Go Go. 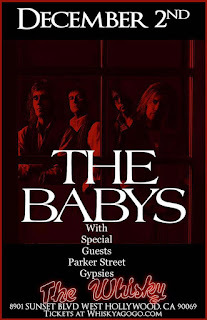 We open for The Baby's, a favorite 70's band of mine (and many others)!! I'm looking forward to seeing and hearing them as well hoping to meet their drummer Tony Brock. His playing was/is a strong influence on my own approach to the drums. I think my favorite album is Union Jacks but I tend to waffle on favorite anything. Believe it or not, there are FIVE bands leading up to The Baby's performance Saturday night; they are: Parker Street Gypsies (us), Alinea, Nation of Salvation, Union of Saints, and Kirk Randall & the Back Beat. We play last but just before The Baby's set. Despite what you may read or hear live music is still out there waiting for you to experience/enjoy. Musicians are still struggling, as ever, to satisfy their muse and play for you/us, no matter how much the business has changed. If you are in the LA area and looking for something to do on Saturday night we'd love to have your support. The Whiskey is an all-ages club, as well as being a famous venue for music historically. 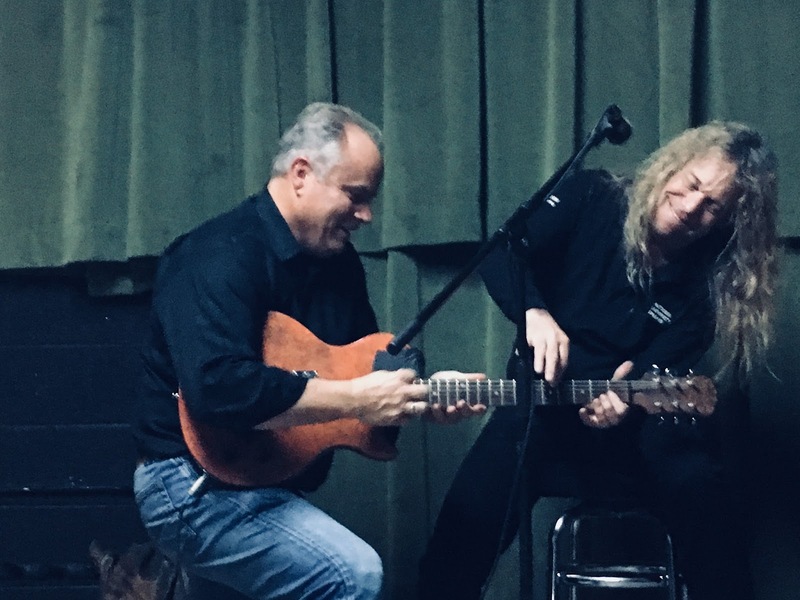 The AU Band consisted of: Robert Green (guitar,vocals), Guillermo Melantoni-Cortabarria (bass guitar, vocals), Steven Shell (guitar,vocals), Shaun Bryant (vocals), Kate Morrical (vocals), Jim Balding (Cowbell-aka Whiskey bottle) and Kelly Cone (vocals)..oh and me. This is a nice shot of Jim Balding helping Steven Shell play guitar or vice versa. We didn't have a cowbell so JB made do with a Four Roses whiskey bottle that somebody conveniently emptied so it could be used. This was my second year playing with them, good fun!